BETTER or IT WILL BE sold Out FAST! Ticket Sales begin Tuesday, April 2, 2013 at 11:00 a.m. (Pacific Time) via www.ArtofDisneyParks.com. Look for more information in the coming weeks. Great news, Disney and Tiki fans! The merchandise events team just finished giving me the scoop on the Walt Disney’s Enchanted Tiki Room 50th Anniversary Event scheduled for June 28-29, 2013. Plus we have a sneak peek of a few of the items that will be offered and some key dates you won’t want to miss. Here’s your official bird’s-eye view of what you can expect … at least everything I am able to reveal right now (hint, hint!). Registered event guests will have the opportunity to purchase Walt Disney’s Enchanted Tiki Room 50th Anniversary Event-themed merchandise via the Random Selection Process. “Early Birdies” Special Offer: Don’t miss out! Register early and receive a limited edition “Early Birdies” pin. 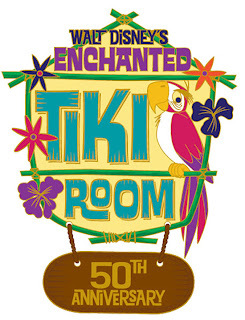 Tip: In order to register for the SHAG Cocktail Reception, Guests must also be registered for Walt Disney’s Enchanted Tiki Room 50th Anniversary Event ‘JOSE’ Package.